Un développement de nouveaux condo de luxe exceptionnel situé directement sur la célèbre plage de Bavaro à Punta Cana, célèbre pour ses plages de sable blanc et ses eaux turquoises. Notre condo est idéalement situé avec un accès facile au rez de chaussée, tout en offrant une vue imprenable sur la plage à travers les piscines et les jardins. Le patio privé est un endroit parfait pour se détendre avec votre café du matin ou un cocktail en soirée. Playa Turquesa Ocean Club est un développement exceptionnel offrant 24 heures de sécurité sur place, de 2 grandes piscines (dont une avec un bar de la piscine), 2 bassins pour enfants, des douches extérieures, zone de réception, ayant un accès direct à la plage avec une belle structure de pergola couverte à l'usage exclusif des clients séjournant à Playa Turquesa. Vous serez séduits par la commodité d'épiceries, restaurants, boulangerie, bars, spas, des fournitures pour animaux de compagnie, pharmacie, échanges d'argent et beaucoup plus, tous à une courte distance de marche. A cinq minutes en voiture vous trouverez à Palma Real Shopping Mall, qui abrite Tony Roma, Hard Rock Café, une salle de cinéma et de nombreux commerces et services du diesel à Quicksilver, Armani à Swarovski, Guess à Puma, ce qui rend pour une excellente aventure de shopping. Ce condo offre tous les nouveaux appareils électroménagers, barbecue à gaz, laveuse / sécheuse, sèche-cheveux, fer / planche, coffre-fort personnel, WI-FI, câble, 2 télévisions à écran plat, lecteur DVD avec de nombreux films pour vous assurer des vacances agréables. Maintenant, avec des écrans sur toutes les fenêtres et portes-fenêtres, les brises tropicales chaudes peuvent être dégustés à l'intérieur et dehors. L'aéroport international de Punta Cana (PUJ) est à seulement un rapide 20 minutes. Disponible sur demande pour un coût supplémentaire, nous fournissons notre propre anglophone service de transfert qui viendra vous chercher à l'aéroport et de livrer votre parti, sans tracas, à notre condo à Playa Turquesa. Location, location, location! A terrific condo within walking distance to lots of restaurants. The beach is great and the pools are good. I would highly recommend this rental. The patio is a real treat. Thank you for your review! The patio is one of our favorite places too. I'm so glad you enjoyed it! Great location with miles of beaches both directions!! My husband and I stayed here over the New Year. We enjoyed watching fireworks on the beach at midnight. The restaurants all around the Condo didn’t disappoint either. Never had a bad meal or service. Everyone very nice and always felt safe as we walked everywhere. One day we walked over 7 1/2 miles in beautiful sunny 80 degree weather. I read a lot of reviews on other condos in this same complex but none of them as good as where we stayed and I can see why now. The property manager and owner both available 24/7 with any needs you may have and had my deposit back days after we returned with no hassle. Would definitely recommend this place for a couple that wants a peice of peradice but doesn’t want to pay the resorts cost. Will definitely be back!! It is so wonderful to hear how our guests enjoy the local surroundings, beach and restaurants. I agree, there are very good restaurants all near by. As the area grows, more keep opening up! Thank you for being fantastic guests and treating our home as if it were your own! We will be thrilled to have you stay with us again! 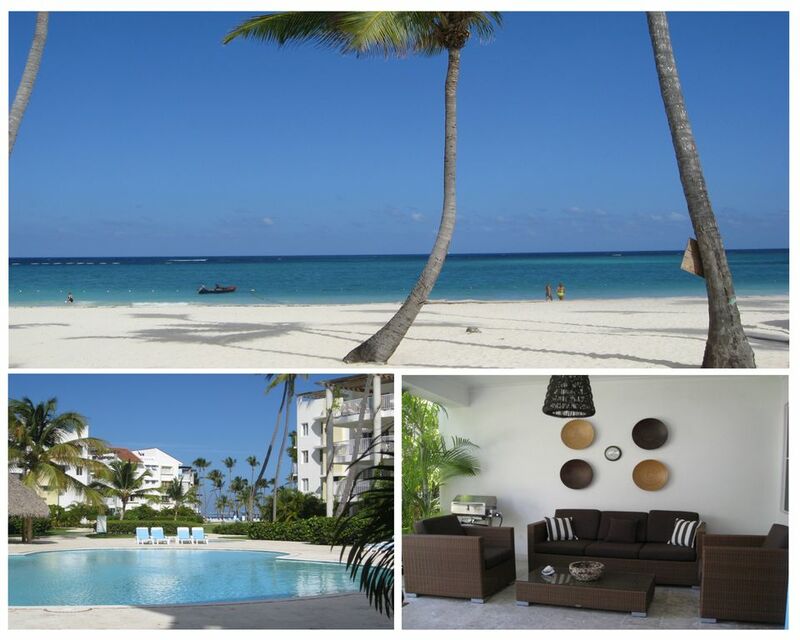 The condo is gated for security and conveniently located in Punta Cana. It takes just a short walk to beautiful beaches. The restaurants and cafes, many of which are highly reviewed in TripAdvisor, are within a walking distance as well as convenient stores and money exchange. During out stay, we had snorkeling and zipline tours, and each tour program was able to pick us up from the front gate and drop us off to the same spot. The condo is clean and well maintained by Gayla and Michael. They are really helpful in meeting our needs. We absolutely recommend this place! It always makes us so happy when our guests find the surrounding restaurants and businesses as great places to frequent. The area is fantastic, there are so many wonderful stores and restaurants within walking distance. The local excursion companies are excellent and accommodating as well. Thank you for choosing our home for your holidays and being such great guests! This was our first time in the Dominican Republic. We are a family of 4 and we were searching for a relaxing 2 week vacation. We pretty much just stumbled across Marianna's condo and I'm glad we did. The cost was hard to beat without even getting there. Once we arrived the location of the condo was perfect. The condo is right next to the pool, within a short walk to the beach, short distance to restaurants, a grocery/market right on premises, etc. We had a few issues come up with the condo that was no fault of our own or the condo's owner. These few issues were dealt with expeditiously by Michael and Marianna. Marianna is very good at communicating and quick to reply to emails when we had any kind of concerns. The excursions we went on were great and Michael helped get those set up at the right price and even helped rearrange times on them. Michael helped with a few stops we needed and was patient and helpful when we had questions and concerns. So all in all great cost, location, and great people to deal with made our vacation everything we wanted and more. Thank you very much for your review! You were absolutely wonderful guests. We truly appreciate your kindness and support. Thank you so very much! Lovely condo in a lovely location. A little piece of paradise! This was our first trip to Dominican and Marianna as well as Galya and Michael (property managers) could not have made it better. Marianna arranged for us to be picked up at the airport (for $5 less than the standard rate) and she recomended that we have our driver stop at the big grocery Store (Jumbo) to do our basic shopping for the week. That was a really great suggestion (even though there are 2 smaller grocery stores within less that a 2 minute walk from the coondo, it was nice to have a bigger selection to start off with). The condo was perfect for us. We loved the ground floor as it allowed us to come and go to the pool or beach easily as well as refilling drinks or lunch. The condo was clean and comfortable and had all the necessary kitchen utensils, towels, grill, etc. we met many lovely people from other condos and most said that their particular condo was bland with not pictures or decorations. This was not the case with Marianna’s condo- it was decorated very nicely and comfortably. We used the a/c very little as there was always a breeze and ceiling fans. I can’t say enough about the property managers Galya and Michael. They became our friends in addition to all the help they gave us. Whatever we needed, they were on top of it. Galya arranged for a massage for me on the patio with a professional massage therapist. They brought their own table and charged less than they charge at the beach and Galya stayed for the hour to make sure we were all comfortable. She is very resourceful, professional and pleasant as is her husband Michael. From the time we requested to book, Marianna was awesome. She was very quick to respond and also very informative. She is pleasant and professional and thorough. We had no trepidation’s going to a country we had not been to before only because of Marianna’s attention to us and details. Thank you Marianna! Playa Turquesa is in a very good location. Anything you need is accessible within a 2 minute walk. Sometimes we walked outside of the complex for a bakery or dinner or to see a band play at a restaurant and sometimes we walked on the beach for dinner. During the day we spent our time on the beach, at TOC, the resataurant and bar at the beach in the same complex or between the two pools. The grounds of playa turquesa are also well taken care of. If you are considering a trip here and one bedroom will work for you, this is the condo I would highly recommend. It was perfect! Wow! I can't thank you enough for taking the time to write such a detailed and wonderful review. I am so glad you enjoyed your time at our condo and in Punta Cana. It is very important to Galya, Michael and me that our guests have the best and most relaxing time possible. Thank you particularly for your kind description of Galya and Michael. They work very hard and are absolutely deserving if the praise! I have often said that I think we get the best guests! You were awesome people to have in our home. You are very welcome! Thank you for being awesome guests. We would love to have you come back anytime...the patio is waiting!! Taxes and are included in rates shown. A $50 credit for electricity is applied to the one week rental. Excess electricity usage is due in cash on check-out (based on meter readings).